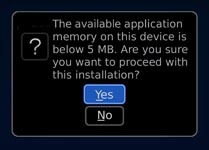 When downloading applications from the BlackBerry App World storefront, you might see a message saying they do not have sufficient memory on your BlackBerry smartphone. If you proceed with the download and installation of the third-party application, it might not perform as expected. You must remove or archive items to free enough memory for the third-party application to work correctly. You can add memory to a BlackBerry smartphone by inserting a media card to extend the memory available and storing media files such as videos, ring tones, pictures, or songs. Deleting unused languages is highly recommended because it significantly increases the amount of available flash memory. On the Home screen, click Setup Wizard. Select the language that you want to use on the BlackBerry smartphone, and click Next. Note: The BlackBerry smartphone deletes all languages not selected. Scroll to the top date and highlight it. Go to Options > Advanced Options > Applications. Click Options > Cache Operations. Under Pushed Content, click Clear. Under Cookie Cache, click Clear. To remove rarely used applications from the BlackBerry smartphone, complete the following steps. You can manually delete old and unused items, and also set the BlackBerry smartphone to delete old items as part of its regular maintenance. Delete MMS messages that are no longer needed. MMS messages can contain large media files that cannot be stored on a media card. If you do not want to delete the media files in an MMS message, open the MMS message and save the media files on the media card before you delete the MMS message. Change the Keep Messages setting on the BlackBerry smartphone to reduce the number of old messages using flash memory. In Messages, click an MMS message. In an MMS message, press the Menu key. In Messages, press the Menu key. Set the Keep Messages field.